After decades in the making, a comprehensive occupational health standard for crystalline silica is in its final rulemaking stage, with a target promulgation date of February 2016. Crystalline silica is one of hundreds of chemicals for which a permissible exposure limit (“PEL”) was included in OSHA’s “Table Z” limits more than 40 years ago. Table Z currently includes PELs applicable to general industry, construction and maritime industries that are based on an obsolete particle count sampling method. If the revised standard is promulgated, it will lower the PEL by half for general industry, from 100 micrograms per cubic meter (µg/m3) to 50 µg/m3 (on an 8-hour time-weighted average); establish a penumbra of ancillary provisions typical of OSHA’s comprehensive occupational health standards (e.g., exposure monitoring, regulated areas, medical surveillance, recordkeeping, housekeeping, etc. ); and set an “action level” triggering various requirements such as exposure monitoring, at 50% of the PEL, or 25 µg/m3 . The new standard will eliminate the existing obsolete PEL and apply the 50 µg/m3 PEL to the construction and maritime industries as well. Industry is highly skeptical of OSHA’s cost and benefit assessment, and is of the view that the rule is extraordinarily costly, technologically infeasible, and is chasing a problem that has been virtually eliminated in the U.S. as a result of industrial modernization and technological improvements in engineering controls already in place without this rule. If the rule is finalized, an industry-backed, broad-based legal challenge is inevitable. OSHA is poised to promulgate an occupational health standard for Beryllium, another comprehensive chemical standard decades in the making. While development of a revised Beryllium standard had been stalled at OSHA since the mid-1970s, an unprecedented alliance between labor and the Beryllium industry’s primary manufacturer and producer resulted in the development of an industry/labor-endorsed standard that was presented to OSHA in 2009. OSHA used the privately develop standard as a starting point for the development of a rule, which was issued in proposed form this past August. The proposed standard lowers the existing PEL for Beryllium by an order of magnitude, from 2 µg/m3 to 0.2 µg/m3, and adopts many of the typical ancillary provisions included in OSHA’s comprehensive health standards. Unlike Silica, however, the proposed Beryllium standard applies to general industry only, and does not revise the current PEL applicable to the construction or maritime industries. The negotiated rulemaking process shaved years off the rulemaking process. It is anticipated that OSHA will set a hearing on the proposed rule for some time in early 2016. In addition to allowing OSHA nearly real-time access to injury and illness data for purposes of directing inspection resources and considering enforcement actions, the stated purpose of the electronic submission rule is to allow the injury and illness recordkeeping data maintained on an employer’s 300 logs to be made public for review by labor unions, customers, competitors, media and anyone else who is interested. 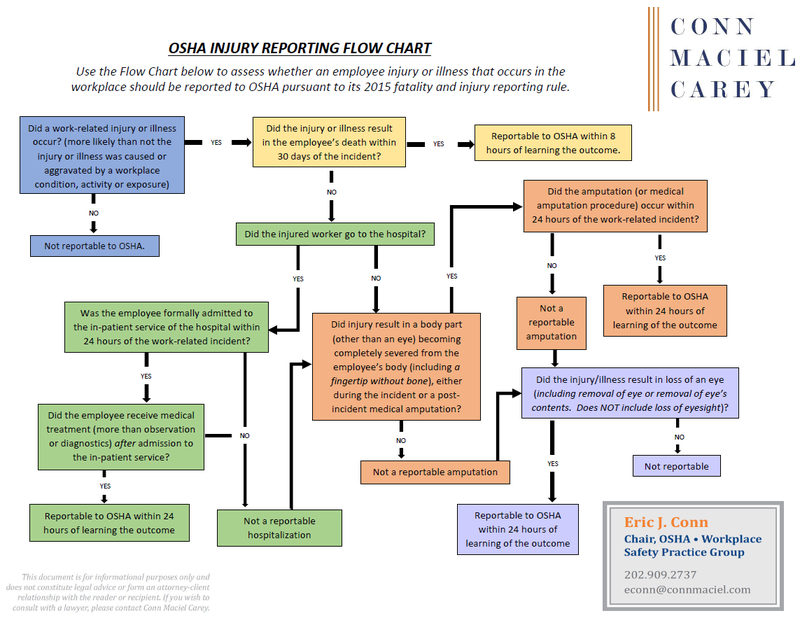 OSHA’s theory behind the rule is that publicizing the data will provide incentive to companies to better protect against injuries and illnesses, and will punish those employers with high recordable injury/illness incident rates. This of course presumes injuries and illnesses are the fault of the employer, and that employers can take actions that will always control the number of recordable incidents at their workplace, two presumptions with which employer groups vehemently disagree. The proposal has been met with widespread criticism from industry. The Regulatory Agenda still lists September 2015 as the target date for OSHA to promulgate a final rule requiring electronic submission of recordkeeping documents has come and gone. The proposal was recently (October 2015) submitted for review to the Office of Information and Regulatory Affairs (“OIRA”) within the White House Office of Management and Budget (“OMB”). OMB typically has a ninety day window to review proposed rules and provide comment to the submitting Agency. With the holidays approaching, however, and in light of the significant opposition raised to the rule in public comment, it is difficult to predict when OMB will release the rule. Another proposed revision to the injury and illness recordkeeping rules would impose a continuing duty on employers to update and maintain accurate injury and illness logs for the entire five year period for which the current regulation requires employers to keep copies of their OSHA 300 logs and related forms. Essentially, this proposal extends OSHA’s statute of limitations period during which OSHA is allowed to bring an enforcement action alleging a violation of the recordkeeping standard from six months plus seven days from the day of the recordable injury (based on the requirement to update the 300 log within seven days of a recordable event plus the OSH Act’s six month statute of limitations) to five years. The proposal does an end run around the decision of the U.S. Circuit Court of Appeals for the District of Columbia Circuit in AKM LLC d/b/a Volks Constructors v. Sec’y of Labor, 675 F.3d 752 (D.C. Cir. 2012). Public comments recently submitted on the rule by employer and industry groups were overwhelmingly critical of OSHA’s proposal as not only wrong-headed and unfair, but a violation of the fundamental constitutional mandate of separation of powers. Here is a link to a set of comments Conn Maciel Carey helped prepare about this recordkeeping rule. No doubt this one will be legally challenged if OSHA promulgates the proposal in final form. A long time in coming, we expect OSHA will finalize and promulgate a new rule addressing slips, trips and fall hazards before the end of the Obama Administration. Although the rule languished in proposed form for more than a decade, in May 2003 OSHA reopened its 1990 proposed rule (55 FR 13360) for further public comment. Broad stakeholder comment provided strong evidence that OSHA’s 1990 rule was antiquated and did not reflect current industry technologies and practices related to fall protection systems and walking surfaces. OSHA published a second proposed rule on May 24, 2010, which better reflects current technologies and processes in place in U.S. workplaces. The 2010 proposal also aligns better with other related OSHA standards. A final rule is expected sometime in 2016. Amendment to the Respiratory Protection Standard re: Quantitative Fit Testing: Appendix A to the current Respiratory Protection Standard allows for the submission of an application for approval of a new fit test protocol, and OSHA is proposing this new rule to address three such applications. Crane Operator Qualification: OSHA proposes to again revise its 2010 amended standard applicable to crane operations in construction. The revisions primarily center around third-party operator certifications, and address employers’ direct responsibilities for ensuring safe operations of cranes on construction worksites. Rules of Agency Practice re: OSHA Access to Employee Medical Records: OSHA has determined that several provisions of the regulation OSHA’s regulations include procedures to be followed by OSHA personnel when obtaining and using personally-identifiable employee medical information. are in need of revision. The Agency plans to amend the regulation to improve its efficiency in implementing the existing internal procedures for accessing personal medical information. Updating Eye & Face Protection Regs Based on National Consensus Standards: OSHA intends to publish a final rule updating its personal protective equipment regulation to adopt by reference ANSI Z-87.1, a consensus standard adopted by ANSI in 2010 for eye and face protection. The new standard would cover not only general industry but the construction and maritime industries that had not been previously covered. This update is part of a long-term project OSHA began over a decade ago to update its standards to reflect current voluntary industry standards, and eliminate references to antiquated ANSI and other standards that had been incorporated into OSHA regulations under section 6(a) of the OSH Act immediately following passage of the Act. 40 years later, many of these standards are woefully out of date. Approval for Maine State Plan: OSHA is seeking comment on whether to issue final approval of the State of Maine’s application to establish an approved state health and safety program. Standard Improvement Project IV: OSHA is initiating a fourth rulemaking effort to identify unnecessary or duplicative provisions or paperwork requirements that are focused primarily on its construction standards found at 29 CFR 1926. Rules for which much work already has been conducted, but for any one of a number of reasons, the Agency has been unable to develop a proposed rule. Noteworthy rules in the first category identified on OSHA’s Agenda include an update to the bloodborne pathogens rule, a rule designed to prevent back-over injuries, updates to the powered industrial truck and lock-out/tag out standards, a new rule to prevent fatalities on communication towers, and possible revisions to OSHA’s process safety management (“PSM”) standard. Of most significance in the second category are the theoretical combustible dust rule and an overarching rulemaking to update outdated PELs that sit in the Pre-Rule stage on the November Agenda. The Agency has been mired down on both these rules, and no significant activity is likely in these areas during the remainder of the Obama Administration. Finally, we bring attention to a new item appearing on the Agenda in the Pre-Rule Stage. OSHA is initiating rulemaking activity to revoke outdated PELs currently included in Table Z, opening the door for enforcement under the OSH Act’s General Duty Clause based on exposure limits listed in voluntary standards such as NIOSH RELs or ACGIH TLVs. Because the PEL problem is a major focus of Assistant Secretary Michaels, even though the concept of deleting obsolete PELs is new to the Regulatory Agenda, we would not be surprised to see further rulemaking activity in this area before Dr. Michaels leaves OSHA. While it would be highly unlikely the Agency could issue an NPRM in the next year, we would not be surprised to see an RFI or other progress. We are following this one with interest. For information about the Department of Labor’s top regulatory priorities for agencies other than OSHA, check out this article on Conn Maciel Carey’s Employer Defense Report blog.